The first thing you want to do is keep size and proportion in mind. What kind of space do you have in your home? Bear in mind that log furniture is not only usable in your cabin in the woods, but in your home in the city as well. So, the pieces of furniture you choose ought to be in proportion to the rest of the room. This way, you will avoid cases where the furniture overpowers the design elements of the room and making it feel confined. If your room is spacious, so should the log furniture. Aim for a room that is proportional and put its size in mind. The last thing you want it one element overcoming the rest. The color is something you cannot afford to overlook. As such, you should go with colors that complement your room. Log furniture usually has its own color. Good timber pieces don’t have a veneer finish, but they have a Benjamin Moore finish which is better since it gives the pieces a protective layer without messing with the natural color of the wood. You can go with aspen, cedar or lodgepole pine. The latter’s logs tend to be light while the cedar has a reddish brown shade. Aspen logs, on the other hand, have a medium brown with dark brown marks. As such, it’s important that you choose the wooden hues that greatly complement your valued home. Log furniture pieces are widely considered to be good investments, but still you need to stay on your budget. The furniture price usually depends on the wood type you settle for in addition to the extra options you incorporate; such as bed rails, more rungs, and the rest. Pine is the most affordable, but it is the least durable. Aspen logs are expensive, but they also last long. Go with what you can afford and choose wisely. For a gorgeous home, you need to aim for a unified look. One that centres around a single theme. If you are in for a rustic style, settle for over-sized logs for your furniture. If you are into a more contemporary style, use delicate logs or use them as trimmings on a cushioned seat. Ideally, don’t settle for a single color theme but try and mix and match various colors so that the result is pleasing and not dull. To make it clearer, if you have a vintage-themed room with a shabby chic set, for instance, adding a pair of log stools can be an excellent way to add variation. Also, take the purpose of the furniture into consideration. If you are going to use the pieces outdoors, then go with pine and cedar. They are pretty durable, water resistant and tend to withstand weather changes. If you wish to use the furniture in a remote cabin or a condo unit located in the woods, you might want to check the weight of the logs. You cabin or condo might be hard to reach and transporting heavy furniture can be a drag. Do not go with any manufacturer you come across just because it’s wood you are looking for. 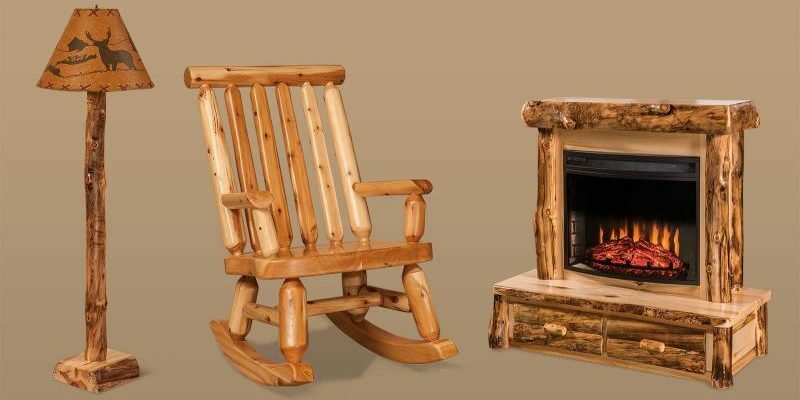 You want quality and finely crafted log furniture that will rhyme with your theme and certainly complements your house. Good timber gives you great value for your money with products that are renowned for their marvellous craftsmanship. The pieces are durable, and they are constructed from carefully chosen logs and handcrafted. Next Post:Whip Your Garage into Shape!